It's very difficult for managers to create a situation where their employees experience psychological empowerment, but the payoff is great for those who achieve it. Empowerment involves preparing your staff by boosting their confidence and competence, and by communicating a clear vision and goals. So many things must be in place for a person to really feel empowered, and what works for one employee might not work for another. On top of those challenges, many managers have difficulty finding time to focus on the needs of their employees because their jobs are so hectic. Nevertheless, empowerment is worth the effort. Effective empowerment of your staff can lead to higher levels of customer responsiveness and innovation, higher levels of employee motivation and satisfaction, lower levels of stress for employees, higher levels of employee skill development, and better time management for managers. 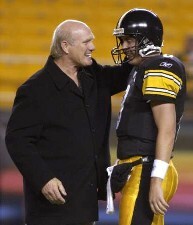 The Pittsburgh Steeler's Hall of Fame Quarterback, Terry Bradshaw (on the left in the photo above with current quarterback, Tommy Maddox), returned to the Steeler's home turf Monday for the first time in 19 years. Bradshaw admits to being too sensitive to have fully enjoyed his relationship with the Steelers during and after his playing days. As a rookie, he had a reputation for being stupid. Bradshaw had the physical gifts needed to be a successful quarterback, but he also had a learning disability (for which he now takes medication) that interfered with his ability to focus and study. His coach, Chuck Noll, pushed him to study and met him half way by keeping the offensive system that Bradshaw ran fairly simple. Keeping the offense simple was more empowering for Bradshaw than giving him twice as many options would have been. Effective empowerment doesn't always mean giving a lot of freedom or rights to someone. Responsibility has to match competence and confidence. Together they won four Super Bowls. Employee empowerment means (a) delegating decision-making authority down hierarchical levels in an organization and (b) giving employees the resources, knowledge and skills necessary to use that authority effectively. Delegating alone does not cause empowerment if the employees who are being given the additional authority are not prepared. Giving employees additional authority and the concomitant responsibility without preparing them actually increases their stress, frustration and dissatisfaction. To feel empowered, employees must have a sense of self-determination, competence, meaning and influence. Employees' sense of self-determination is the perception that they are free to make choices, and that their actions are not controlled by policies, systems or managerial dictates. Granting autonomy to employees helps them feel a sense of self-determination. The higher employees' competence, the more they appreciate and thrive when given autonomy. On the other hand, new employees or employees who need to acquire new skills must develop confidence in their abilities before they feel empowered by that autonomy. A sense of meaning in employees' work refers to the extent to which employees believe that their work affects the lives of others either directly or indirectly. This is not to say that only people working on "life and death" matters feel empowered. As long as employees perceive that doing their job satisfies important needs of internal or external customers, they'll see the meaningfulness of their work. Finally, employees must feel like they are able to influence people and events in important ways in order to feel empowered. Effective empowerment involves planning and a long-term commitment. Delegating makes just about every list of time management tips, and it absolutely can be an effective way for managers to boost their personal productivity. However, effective empowerment is no quick fix. For empowerment to be most effective, the objective for managers and their employees must be one of incrementally building the employees' competence. It's counterproductive to dump duties and responsibilities on employees without forethought and preparation just to get them off your desk. Employees may see that as disorganization, poor time management or shirking of duties. It takes careful planning to get a $20K/year staffer to happily accept responsibility for an ever-increasing number of the duties of his $50K/year manager! Two major components of getting subordinates ready to have tasks delegated to them are boosting their knowledge and skill levels and helping them to feel competent. This means that managers who want to empower their staff must be trainers. Some of the keys to effectively teaching adults include (a) telling them what they will be learning and why, (b) providing information and demonstrations, (c) allowing opportunities for practice, and (d) providing feedback on performance. Confidence in one's abilities comes from successful performances, observing others perform successfully, and encouragement. By having subordinates learn to perform a big task one piece at a time, managers can increase their subordinates' confidence in their abilities, which helps them progress toward becoming proficient with the entire task. Having the chance to watch others successfully perform a task also tends to boost confidence. Hence, having good role models can assist the empowerment process. Words of encouragement can increase employees' confidence as well, so managers should commend employees' progress as they learn. Once employees have developed the competence and confidence necessary for effective empowerment, they need to have a clear sense of leadership's vision and the goals for their performance. The vision helps employees understand how and why their work is meaningful. The best visions are mental pictures of an ideal future state that are vivid, ambitious and exciting. A shared vision helps a team coordinate their efforts, because it unifies team members' priorities. When your employees understand and embrace your vision, they're in a good position to spontaneously seize opportunities to do things that bring you closer to the realization of that vision. Promoting that kind of constructive spontaneity is one of the major reasons for empowering employees. While a vision can be a rich and complex picture of a desired future state, it also helps to set specific goals en route to that vision. As the October 5 LeaderLetter notes, SMART goals tend to lead to the highest levels of performance. Specific goals actually lead to higher performance than "do your best" as a goal. Vague goals can cause inertia or misdirection. Measurable goals are an alternative to abstract or intangible goals, and they're normally expressed in numerical terms (i.e., units to produce) or certain "deliverables." Goals should also be Aligned with the overall strategy and priorities of the organization in order to avoid conflict or efforts that are counterproductive to the organization. Goals should be challenging but Reachable because they'll fail to motivate effort if there's no chance of successfully achieving them. Finally, a Time limit for accomplishing goals should also be specified. Creating a situation in which employees will feel and act psychologically empowered is very complex, and it requires a lot of planning and communicating. This is particularly difficult for managers who have many direct reports or who have difficulty finding time in their schedules to focus on developing their staff. Empowerment requires boosting their confidence and competence, and communicating a clear vision and goals. However, the payoffs associated with psychological empowerment justify the time invested. Effective empowerment of your staff can lead to higher levels of customer responsiveness and innovation, higher levels of employee motivation and satisfaction, lower levels of stress for employees, higher levels of employee skill development, and better time management for managers. 1. Bouchette, Ed. (2002, October). Bradshaw: "It's Great to be Home." Pittsburgh Post-Gazette, October 20, p. C1. REUTERS/David DeNoma: e-mailed to me from Yahoo! News (news.yahoo.com). Hughes, R. L., Ginnett, R. C. & Curphy, G. J. (1999). Leadership: Enhancing the Lessons of Experience. New York: Irwin McGraw-Hill. 1. 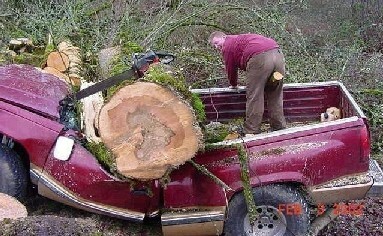 Never park down hill of a tree you are cutting. 2. When in doubt, park twice as far from the tree as the tree is tall. 3. Living within driving distance of a forest does not make you a lumberjack. 4. Always use the neighbors truck.